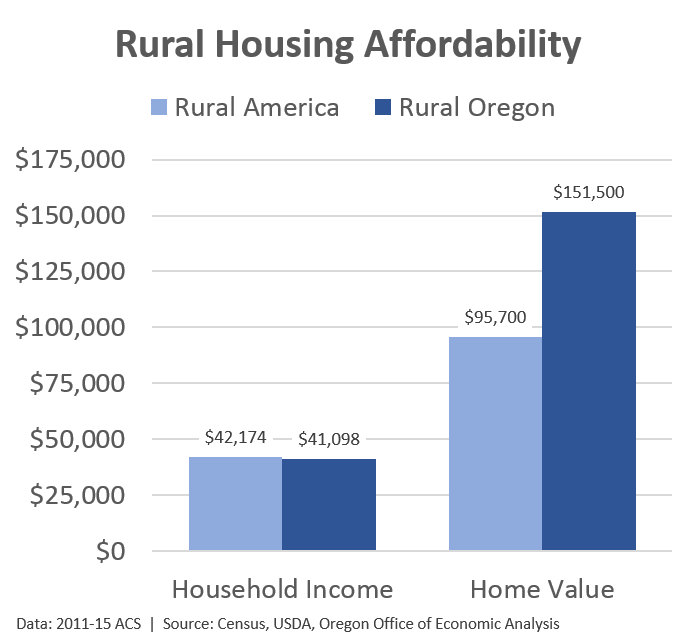 As a general rule of thumb rural areas have roughly 20% better housing affordability than urban areas across the U.S. Yes, incomes tend to be lower, however housing costs even more so. That said, a portion of rural communities face significant affordability challenges that are every bit as severe as some of the popular metropolitan areas. This is true here in Oregon, and the broader Mountain West as well. 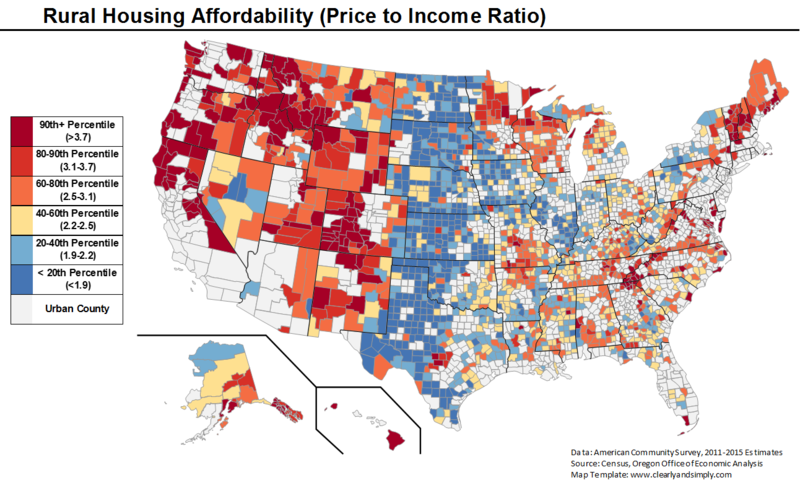 In presentations our office regularly uses the map below to discuss how affordability really is a statewide challenge. It uses the price to income ratio, or actually the median home value to median household income ratio, for all rural counties in the nation. The color groups are tiered by quintiles, or deciles. The darkest red counties represent the 10% least affordable rural counties in the country. These areas face affordability challenges on par with the 20% least affordable urban counties in the country. The patterns you see here include many resort towns and vacation destinations. This includes places like the coastal Northwest, the Boundary Waters, the Smoky Mountains, ski towns in Colorado and New England, and the like. One reason for the lack of affordability is the external demand, or the demand for second homes. Housing prices are not entirely representative of local incomes, but rather those able to afford vacation homes in some of the country’s most scenic areas. However what also stands out is the broader Mountain West which is almost entirely orange or red. And while it can be a bit hard to tell what exactly is going on, we do know that not every one of these counties is a resort destination. In analyzing the data it’s not that incomes are particularly low — roughly inline with rural incomes across the country — rather it’s that housing costs are high. This is certainly true here in Oregon, as seen in the graph below. Furthermore, these affordability challenges stretch across the entire region and across a group of states with considerably different land use laws among other things. My take is at least some of the regional affordability issues depend upon when development occurred over time and then demographic and population changes in recent decades. It’s no question that most rural communities face demographic challenges, however some more than others. Many of the rural counties that have seen population growth, or at least not large declines, are here in the Timber Belt and the West more generally. As such, demand remains relatively strong. This is unlike the Plains, which is where I’m from. Many of those communities have housing stocks that were built for a larger population in decades past. For example the southeastern Kansas county where my Grandma spent much of her adult life (She’s still alive! Love you Grandma!) peaked in the 1920s in terms of population and her town literally had a brick factory. The housing market, and overall public infrastructure for that matter was built to accommodate all those residents. However as population has declined, roughly half a percent per year in recent decades, it means vacancy rates are rising and so too is affordability. Such rural communities, not unlike some of the Rust Belt metros in the Housing Trilemma, face their own sets of challenges that are considerably different than regions with growing pains. That said, rural development does face some challenges itself beyond just market demand. Geographic isolation can raise the costs of materials due to longer transportation hauls, for example. Would love to hear your input too on this given we don’t have a complete story for why the patterns look the way they do. Email me here and let us know! Finally, there are a number of additional charts below for those interested, including a histogram of where each Oregon county lines up across the country.